Max showed a valuable point there. However, since your wood is preheated, you will have a wery similar effect to condensing hopper. In my experisnces, moisture is a performance killer specialy at low gas demand. You will never idle or highidle so you will get by better. I think if you dont burn greenwood you will be fine. If you do, some condensation will be required. In general yes, the dryer the better, so guys condense out as much water/tar as possible. The thing is, running for so long and burning so much moist fuel, and condensing all the condensate from the heated hopper, you will end up wit enormous quantitys of tarry condensate you cant just spill out anywhere. I think its better to pass some water trugh the hearth, condense out in the gas cooler anddispose this clean condense out anywhere you want. I read the CHP papers, they indicate very high hydrogen in their gas. I wonder if that is due to the extra moisture? The process is a balancing act. The greatest gain is that the N2 has gone down to almost half of what it is in a single stage process. The increased H/CO ratio makes a faster burning process, still with no increase of CO2. Others (like yourself), and @k_vanlooken will understand this, but from my layman point of view it looks like they have done something fundamental here. Are they managing to use process heat to crack water, and thus continuing the oxidation and pyrolysis process with significantly reduced use of air? Sounds like a significant efficiency gain. It takes less hearth energy to crack superheated steam (available from the preheater process) than starting first to boil and to superheat water from cold wood. And whole the pyrolysing heat demand. With other words: The nozzle blasted heat extends better to crack more superheated steam, when there is no need to start from cold-wood-humidity. The same principal (in a way) is the aim with the “plank” gasifier. But it can also condens a part of the silo wood humidity, not available (so far) in the Viking. Im going to conserve as much heat as possible from the process for the pre heating of wood chips. The first gasifier build is going to be a downdraft gasifier like I have shown in post 1, later as I learn more and get more experience I like to try to build a upstream gasifier like the Viking. But to save time and not deviate from the original Ill build as close as possible to my first idea. I already have multiple thermocouple sensors type K to see what is going on inside the gasifier, to measure inside the heart I need to find another type of sensor. I did read their paper, the numbers don’t ad up. The energy balance for each process is theoretical calculated and real value’s enhanced to sell a product. If they work on their gasifier a bit more careful to reduce the huge co2 content they have now, i could believe the numbers. I rely liked the performance they got from the Viking gasifier, and the duration of time they had it going non stop is unlike any I have seen before. 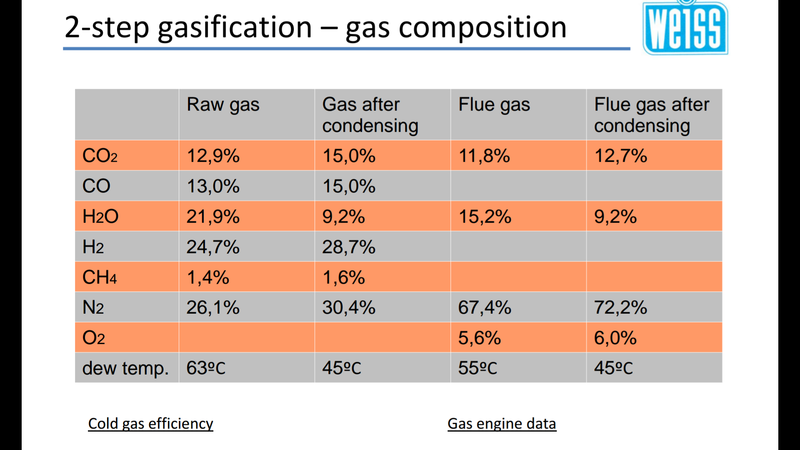 The documentation of this gasifier is from a good university in Denmark and Im not going to despute that. You need to think about the humidity of the air you put in the system too. Like I said, they have many good ideas on efficiency of the plant. Also the automation they did to have it self running for so many hours is impressive and a goal to reach for. I think the most important things they report are the content of nitrogen, and hydtogen. Let’s suppose that the 50% m/c fuel is a mis statement. If the nitrogen and hydrogen contents are reported accurately, as seems so, they have something significant going on here? The low amount nitrogen comes from the “first stage retort” it produces a “rich gas” no extra air injected. the shown temperature zones in their prospect are actual glowing if the numbers are correct. My feeling is that Roger is going to build something that we all can learn from and benefit. In the absence of materials and the freezing cold at the moment I have started to build the governing of the CHP build. Im using a Siemens S7-300 PLC, a Phoenix contact analog input with 16 temperature sones termocouple type K and a distributed IO that has 16 digital inputs and 16 digital outputs for now. I use PROFIBUS as communication between the units. Wow, S7 and profibus. Same stuff we use at work. I´m more the old school relay type of guy since almost 20 years past since I was in the business. JO and Kristijan this is outdated equipment from where I work, we dont use profibus any more, these days its all about profinet (ordinary network for the industry). As for cost you would think it is expensive but if you look up the newer S7 1200 PLCs they have come down in price compared to what it was some years a go. A automated CHP needs a PLC. Im also going to try something new for me and that is to use Labview to log temperatures and as a HMI, that means OPC server between the two systems.